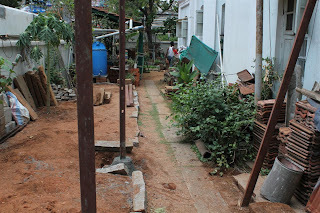 A post was done on April 1 showing a couple of pictures of the re-shape of the garden. See that here to recollect. [Click] June is the best time here in Mysore to start a garden. A dry and warm summer had ended with a couple of rains at the end of May. In the first week of June, things were set as I had wished. 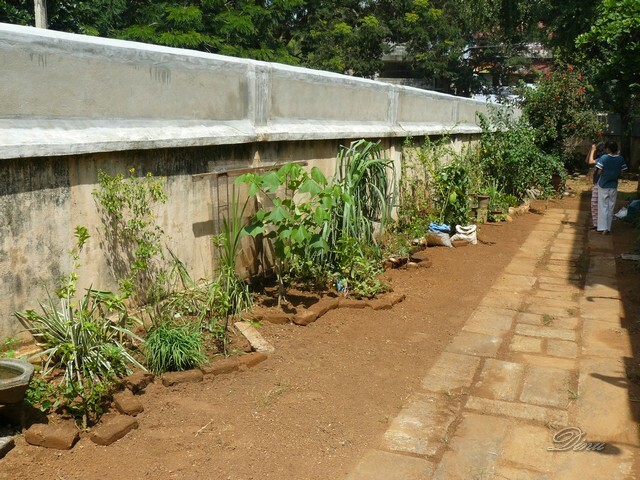 I had cut off a papaya tree near the wall as it was a hindrance to my plan. We had enough fruit from it. Since there was an infestation of mealy bugs, I removed it entirely, which anyway I would have done. This was a volunteer plant that grew there and saw all that took place in the yard during the 2 years. 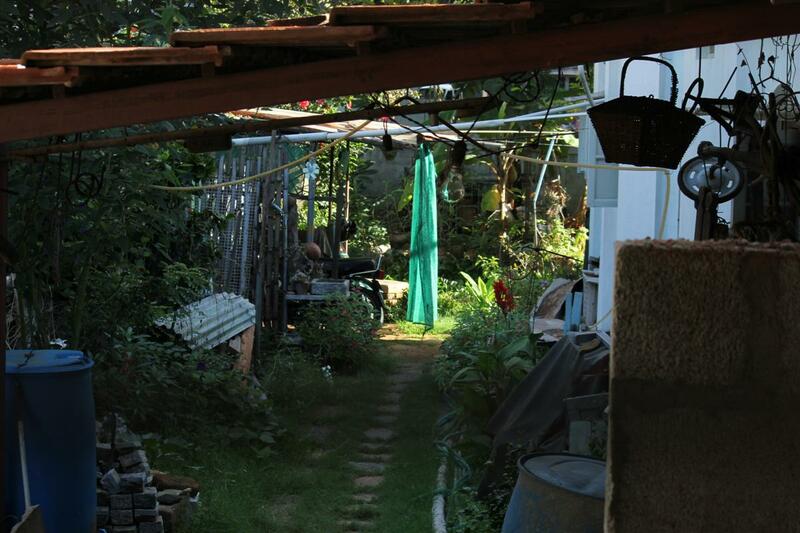 I show a few pictures of the same place before showing how it is now, towards the end. All pictures you will see were taken from either end. Keep an eye on the house/wall to know. Those were in 2008 when the house was partitioned and my garden had to shift from the eastern side to here to the west of the house where I shifted. It gets full afternoon sun on this side. See the compound wall has been raised. Some more developments started to shape in 2010 when a new house was planned to come up behind our old house. Again, the garden was in jeopardy. No asking why, just see the following photos. It was like this earlier. When I shifted the garden I had moved the plants in sacs. 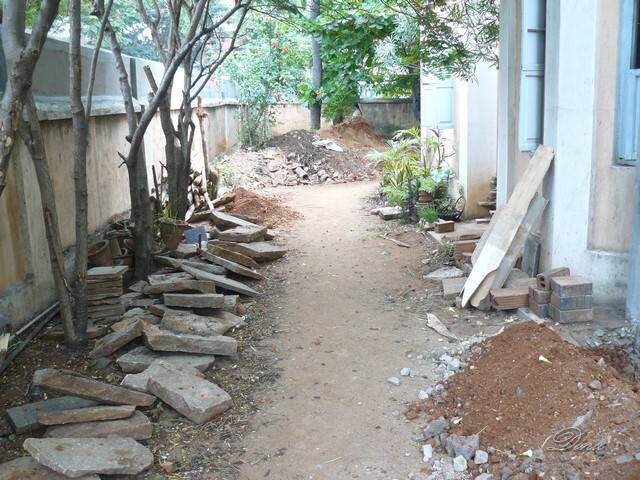 All the things that were in that demolished tiled room where the new house came up had to be moved out into the yard. My infant garden became overcrowded with zillions of things! My gardening had taken the backseat. Slowly, the things were cleared, organized and reused. Added to that, more construction materials had to be kept there during the house construction. Bicycle of a construction worker. Just enough space to walk! July 2011. 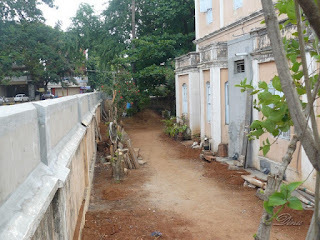 See changes and the new house at the back. The tiled shelter which you saw in the preceding view was reversed to the compound wall. You can see the frame in the above picture taken April 2012. Did you see the Papaya Tree there? Keep an eye on that now. Papaya tree grown tall, higher than compound wall. Pictured September 2012, now the garden area was set. View from first floor room. Did you see papaya tree? That is my garden area now. You saw pictures in the link. Now let me tell how I started my 2013 season. I have to limit my plants now as the area is small. Last year, a kind friend from Dave's Garden, Dee, had sent me some ten varieties of seeds for me. Now was the time to start them. I had gone to the Pinjrapole Society and bought 50 kgs of vermicompost. I am using such compost for the first time. 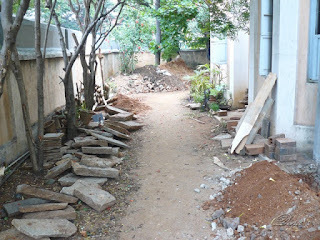 I had prepared beds by sieving out the soil and separated the stones and small hardened cement clumps that had got mixed up during construction work. I have added compost and planted Gladiolus bulbs there. I had to use the seed tray now. Seeds from Dee were tiny. I filled the tray with half soil and half compost. This is how I put in seeds. My watch-repair tray came in handy to tap the tiny seeds. Those are Primrose seeds. To know what went where in the tray, I made an index. As I saw standing up. New bed added. Now that is where the Papaya tree was. Now there is mint I transplanted from another bed. I sowed seeds of beans near the wall and sowed Coriander [Cilantro] beneath the green gate. I grew it in March also. But now I have added compost to the soil and have to see results. So much for now. We have not had rains the first 9 days of June. Let us hope it will be a good monsoon this year.